Our transformational interior design is an immersion into a new way of thinking about interior design and personal empowerment. Learn about our unique set of design strategies by clicking a link. Each case study shows a different approach based on the personal needs and sensibility of our clients. Transformational Interior Design is an immersion into a new way of thinking about interior design and personal growth. We use a unique set of design strategies to transform your environment into more than just a gorgeous space. Drawing from these strategies in a distinctly personalized approach, whether you want to simply remodel your space from drab to fab, open up your small space or harmonize the differing sensibilities and desires you have as a couple sharing the home. We can even design a space with the intention to bring overstimulated parents back to balance, create a sublimely romantic bedroom or do a sustainable remodel. 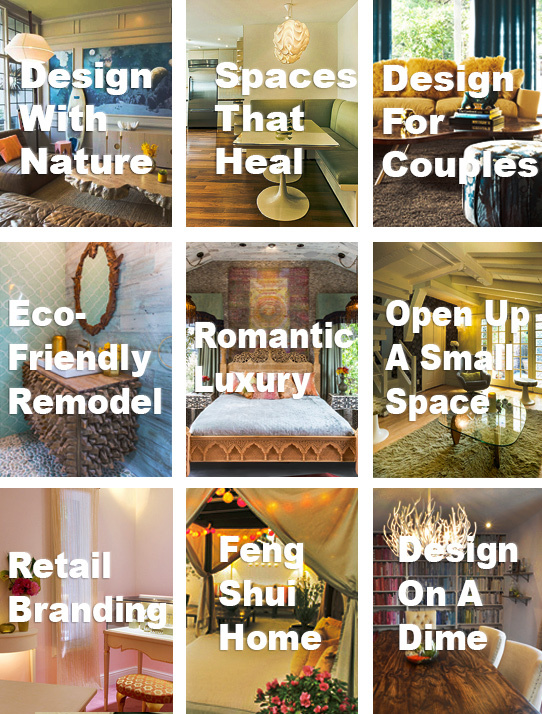 Our thoughtfully curated spaces can even help to manifest a relationship or restore balance to or your life—we are well experienced in creating spaces that heal. The end result is a home, office or retail environment that positively impact your mind, mood and quality of life. We can also use this proprietary design process to bring out the distinctive characteristics of your brand in your office or retail space. When design is implemented as a tool for transformation it can add an extra-special layer of intention that goes beyond aesthetics and functionality: it can create a space that helps to calm your overworked mind or empowers you and inspires you on a personal basis.